In this fictional country there is a billionaire who lives on the fringes of society who, come nightfall, dresses as a bat. Somewhere, in a state far across that country is a pastel-coloured suburb that has a collapsing Gothic ruin towering over it. Inside, among the debris of its decaying attic, lives a young man whose fingers are scissor blades. Elsewhere the ghosts of a married couple haunt their idyllic home and a film director is unknowingly making the worst film ever. All of these lives are marked by some sense of tragedy and are lived out by individuals who, through choice as much as circumstance, live on the very edges of normal society. These people, who are aware of their difference and so conduct their lives by their own codes and morals, seek not to become part of normality but simply to interact with it. And, in most cases, they are really only one person – Tim Burton. In perhaps true auteur fashion, it could be argued that if you have seen one Tim Burton film then you have effectively seen them all, so distinct and persistent is his vision. His growing body of work is populated with stripes, concentric swirls and pools of darkness that are all shot through with a manic humour; grotesque images are compounded by their Gothic trappings; there is an occasional preoccupation with falling snow and faithful dogs; there’s the distinct lack of parental figures; the repeated occurrence of resurrection collides with a total disrespect for authority; generic subversion is a mantra; the protagonist must be an outsider and the narrative fixated with how they came to be that way. The source for this ‘wonderful mess’ lies not just in a perceptive artistic vision but in one that seemingly attempts to make physical the past in order to relive it, experience it and understand it. It is a concerted attempt to embrace something that was once painful in order to accept it. This may seem like a grand elevation of the ‘visionary’ Tim Burton – an emotive reading of the pained artist to quantify the repetition – but a cursory examination of Burton’s childhood and subsequent development into adulthood demonstrates foundation experiences that have been absorbed and reworked, reiterated and relived into one of the most popular bodies of contemporary cinematic work. It may well be art but it is also entertainment, a tragedy and a comedy, a reflection of the self as much as wider society. Timothy William Burton was born in the Los Angeles suburb of Burbank. His father, Bill, who had nearly become a professional baseball player, worked at the Burbank Parks and Recreation department while his mother, Jean, ran a shop that sold a range of items associated with cats either through purpose or motif. While seemingly having a normal life, at the age of 12 Burton left his parents and younger brother, Daniel, in order to live with his grandmother. By his own admission, Burton was an introverted, destructive child – he would try to convince the boy next door that an alien invasion had begun or would tear the heads of his toy soldiers. At 16, he had moved out once again and lived alone in a small flat above a garage his grandmother owned, earning his rent by working in a restaurant after school. Throughout his childhood, Burton found a particular attraction to both film and television – The Prisoner, Gilligan’s Island, Roger Corman’s Edgar Allan Poe adaptations, King Kong, Frankenstein, Creature from the Black Lagoon, and Godzilla all dominated his choice of viewing. From this brief biographical sketch, the comparison between Burton and his on-screen alter egos is perhaps beginning to become apparent. 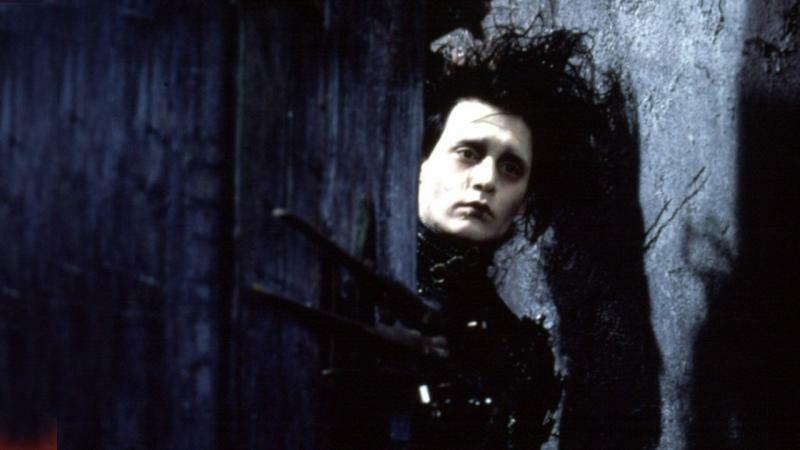 This is most evident in the image of Edward Scissorhands – the tall, gangly boy with wild black hair who, without parents, lives alone above suburbia in an attic and who creates marvellous topiaries, is really no different to the tall, gangly, wild-haired Burton who lived alone and above suburbia in his grandmother’s flat. When he wasn’t at school or working Burton was drawing, creating images based upon his visual experiences and imagination. As one looks closer at Burton’s oeuvre the traces become more obvious – the attic is where the ghostly Maitlands live in Beetlejuice and, in the belfry, it is where the Joker confronts his maker, Batman; throughout most of his films the protagonist lives alone as their parents are dead (it is only recently that they have begun to appear alive – most poignantly in the reconciliation scene between Willy Wonka and his dentist father) and the narrative threat is (like King Kong and Godzilla) often monstrous and destructive. All this may reasonably indicate a clear and sustained relationship between Burton’s life and his cinematic work, and Burton’s own reflections on his childhood both support and undermine this possibility: while Burton has indicated that he was perhaps considered strange by his peers he also notes that he did have friends and that, when alone, such a position allowed him to see the world from ‘an external point of view’: ‘That meant my perception of normality was strange. For me, reality is bizarre.’ Burton did not feel that this isolation was abnormal, stating: ‘Every time I looked around… it looked like everyone had their own private world… They were in their own special worlds.’ (Smith & Matthews, Tim Burton) For Burton, being alone, isolated and alienated was just part of growing up, an essential aspect that shapes your perspective on the world around you. This idea of alienation shaping a persona’s interaction with the world is evident in Burton’s protagonists: the animated Vincent Malloy channels the everyday world through his imagination and transforms it into a tragic rendering of Poe’s work; Lydia Deitz would rather be dead than endure her parents Technicolor world and so sides with the ghostly Maitlands; orphaned as a child, the young Bruce Wayne evolves into an isolated figure bent on revenge that he hopes will positively transform the world he is apart from; Edward’s experience in ‘normality’ not only highlights his difference but enhances his emotions and creativity; Jack Skellington’s desire to be Sandy Claws not only leads to chaos and destruction, but also to the realisation that he is better off doing what he does best – ruling the land of which he is king. The connections and parallels sustain themselves throughout Burton’s oeuvre to the extent that, in the end, perhaps Tim Burton’s films are a unified project because they are a repeated filmic attempt at a constructed and now expected self-portrait. The narratives, the images, the look and the sounds have all become moments in which the director’s past is not only repeatedly made present but in which it is repeatedly amplified. They come together to form an unfolding fictional text that seeks not to work out why but to celebrate why not, for in that fictional country it is far better to be on the outside, to be the alien who has the choice to remain without instead of being forced within.